Israeli forces continued to use excessive force against unarmed civilians and peaceful protestors in the Gaza Strip. 278 civilians, including 46 children, 10 women, 4 journalists and 9 paramedics, were wounded. Twelve of those wounded sustained serious wounds. A Palestinian was shot dead by Israeli police in Jerusalem, and another died only few hours after his arrest. 8 Palestinian civilians, including a child and journalist, were wounded in the West Bank. An aritilery shell fell inside Abu T’eimah School in ‘Abasan al-Kabirah, causing material damage to two classrooms. Israeli forces conducted 75 incursions into Palestinian communities in the West Bank, and 2 limited incursions into the Gaza Strip. 75 civilians, including 8 children, and a French activist were arrested in the West Bank. 33 of them, including 3 children, were arrested in Jerusalem. A child was arrested along the border fence in the central Gaza Strip and was released after being questioned. 5 dwellings temporarily set by Palestinian activities near Khan al-Ahmar Bedouin Community were demolished. 4 civilians were denied entry into al-Aqsa Mosque. Settlers have established a settlement outpost and burnt 200 olive trees in southern Bethlehem. Shooting was reported against the Palestinian fishing boats in the Gaza Sea, but no casualties were reported. 3 fishermen were arrested, and their fishing boat was confiscated. 8 Palestinian civilians were arrested, including 3 children and a girl, at the military checkpoints in the West Bank. Israeli violations of international law and international humanitarian law in the oPt continued during the reporting period (13 – 19 September 2018). At approximately 01:00, Israeli forces moved into Beit Ummer village, north of Hebron and stationed near the Great Mosque in the center of the city. They raided and searched a house belonging to ‘Ala’a Mousa al-Za’aqiq (34) and then arrested him. It should be noted that the Israeli forces handed a summons to ‘Ala’a a week ago after they raided his house. Meanwhile, another Israeli force raided and searched a house belonging to Ahmed Khader Abdul Qader Abu Hashem (52) and then arrested him. Around the same time, Israeli forces moved into al-Thaheriyah village, south of Hebron and stationed in al-Deir neighborhood. They raided and searched a house belonging to Abdul Hamid Mohammed al-Battat (29) and then arrested him. At approximately 02:00, Israeli forces moved into Husan village, west of Bethlehem. They raided and searched a house belonging to Mahmoud Tam’ah Abdullah al-‘Aredi (25) and then arrested him. Around the same time, Israeli forces moved into Barqin village, west of jenin. They raided and searched a house belonging to Basem Yasser Abu Shadouf (23) and then arrested him. At approximately 02:30, Israeli forces accompanied with 3 military vehicles moved into Halhoul, north of Hebron. They then raided and searched a house belonging to Hazem Ahmed ‘Ali Zama’rah (24) and then arrested him. Around the same time, Israeli forces moved into Beit Rema village, west of Ramallah. They raided and searched 2 houses belonging to Ismail Mohammed al-Barghuthi (23) and ‘Adli Farah al-Remawi (26) and then arrested them. At approximately 04:30, Israeli accompanied with 4 military vehicles moved into Betunia village, west of Ramallah and stationed in al-Fawakeh intersection. They raided and searched a house belonging to ‘elian al-Hendi (59) and then arrested him and his son Omer (27). At approximately 08:00, Israeli forces accompanied with a number of military vehicles and bulldozers moved about 50 meters from the border fence between the Gaza Strip and Israel near Sofa military site into the east of al-Shawkah village, east of Rafah in the southern Gaza Strip. They leveled and combed the area and then redeployed along the border fence at approximately 09:30. At approximately 10:20, Israeli gunboats stationed offshore, adjacent to Sheikh ‘Ejlin shore, west of Gaza City, opened fire at Palestinian fishing boats. The gunboats surrounded a fishing boat manned by 3 fishermen namely Mohammed Abdul Razeq Baker (47), his son Mohammed (20) and Mohammed Sobhi (20). The soldiers forced the fishermen to take off their clothes, jump into the water and swim towards the gunboats. The fishermen were then arrested and their boat was confiscated. Note: During the aforementioned day, Israeli forces conducted (11) incursions in the following areas and no arrests were reported: Hebron, Surif, and al-Mawreq villages in Hebron; Kufor ‘Aboush, Kufor Zebad, Baqa al-Sharqiyah, Qifin, ‘Alar and Beit Led villages in Tulkarm; Joyous village, northeast of Qalqiliyah. At approximately 08:00, Israeli forces accompanied with a number of military vehicles moved about 70 meters into the east of al-Qararah, east of Khan Younis in the southern Gaza Strip. They leveled the lands adjacent to the border fence and redeployed along the border fence few hours later adjacent to Khuza’ah village. At approximately 19:33, Israeli forces stationed along the border fence between the Gaza Strip and Israel, east of Khan Younis in the southern Gaza Strip, fired an artillery shell that fell in Abu Ta’imah Elementary School in ‘Abasan al-Kabirah village, which is 2 kilometers away from the border fence. As a result, 2 classrooms sustained damage and the school day was suspended in the next day. It should be noted that 2,500 female and male students in elementary and preparatory grades study in the school on 2 periods. Meanwhile, the Israeli forces fired 2 artillery shells at a border control point belonging to Palestinian resistance groups. 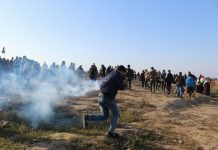 The site was hundreds of meters away from the place where protestors gathered near the March of Return and Breaking Siege, east of Khuza’ah village. The shelling caused material damage to the site, and caused fear among civilians, particularly that but no casualties were reported. Note: During the aforementioned day, Israeli forces conducted (11) incursions in the following areas and no arrests were reported: Hebron, Yatta, Beit Ummer, Sekkah, souse, Beit ‘Awa villages in Hebron; Safarin village, southeast of Tulkarm; ‘Azzoun village, east of the city; Bruqin and Kufor al-Deek villages, west of Salfit. At approximately 02:30, Israeli forces moved into Nablus. They raided and searched several houses and then arrested Mohammed Mo’een Tabanjah (28) from al-Marij Street in Rafidiya neighborhood, west of the city; and Haitham Mahmoud al-Ka’kah (30) from Khelat al-‘Amoud, southeast of the city. At approximately 16:30, Israeli forces stationed along the border fence between the Gaza Strip and Israel arrested Sa’ed Mohammed Sa’ed al-‘Awawdah (15) from al-Buraij refugee camp. At approximately 23:50, the Israeli forces released Sa’ed through Beit Hanoun “Erez” crossing in the northern Gaza Strip. Note: During the aforementioned day, Israeli forces conducted (9) incursions in the following areas and no arrests were reported: Hebron and al-‘Aroub refugee camp, north of the city; Tulkarm and Noor refugee camp, east of the city; Far’oun village, south of the city; Bruqin, al-Zawiyah, Kufor al-Deek and Mashah villages, west of Salfit. At approximately 01:00, Israeli forces moved into Bethlehem. They raided and searched a number of houses and then arrested ‘Essa Ibrahim Abu ‘Ahour (31) and Mohammed Hasan Nawarah (23). At approximately 01:50, Israeli forces moved into Qalqiliyah. They raided and searched a house belonging to Anas Malek Dawoud (28) and then arrested him. At approximately 01:55, Israeli forces moved into ‘Azoun village, east of Qalqiliyah. They raided and searched a house belonging to ‘Aref Yusuf Saleem (38) and then arrested him. At approximately 02:30, Israeli forces moved into ‘Awerta village, southeast of Nablus. They raided and searched a number of houses and then arrested ‘Ali (36) and his brother Theeb As’ad Abdul Karim Loulah (36). Around the same time, Israeli forces moved into Beit Ummer village and stationed in al-Thuhor neighborhood. They raided and searched a number of houses after which they arrested Abdullah Ahmed Redwan Ekleil (21) and Husein ‘Ali Husein ‘Adi (20) and then took them to a detention center in “Gush Etzion” settlement complex, south of Bethlehem. At approximately 03:30, Israeli forces accompanied with 2 military vehicles moved into the southern area in Hebron and stationed in al-Fahes neighborhood. They raided and searched a house belonging to Farid Hmedan al-‘Oweiwi (39) and then arrested him. At approximately 22:30, Israeli forces moved into Nablus to provide protection for settlers, who arrived at the area to perform their religious rituals and Talmudic prayers in “Joseph Tomb”, east of the city. A number of children and youngsters gathered and threw stones and empty bottles at Israeli soldiers. Meanwhile, an ambulance belonging to Palestinian Medical Relief driven by an officer namely Jarir Zakariya Nathmi Qanadelo (48) and volunteer paramedic, Amir Sa’ed al-Bazrah (24), was heading to Aman Street, east of the city. The ambulance stopped near Abu Zant Mosque away from the clashes point to transfer any possible injuries. At approximately 11:30, an armored personnel carrier passed near the ambulance and a soldier fired a live bullet at it. As a result, the right side window was broken and the glass scattered over the paramedic and driver. Jarir was hit with the glass shrapnel to the Left forearm and neck, and Amir was hit with a tear gas canister to the right eye and face. The clashes between Palestinian civilians and the Israeli forces resulted in the injury of 2 civilians, including a child who was hit with rubber bullets. Note: During the aforementioned day, Israeli forces conducted (5) incursions in the following areas and no arrests were reported: Nahalin village, west of Bethlehem; ‘Ezbat Shufa village, east of Tulkarm; Halhoul, Surif and Nuba villages in Hebron. At approximately 01:00, Israeli forces moved into ‘Ein Beit al-Ma’a refugee camp, west of Nablus. They raided and searched a house belonging to Fadi Khalid Jabri (21) and then arrested him. At approximately 01:30, Israeli forces moved into al-Nabi Saleh village, northwest of Ramallah. They raided and searched a house belonging to Saleh Daifallah al-Tamimi (37) and then arrested him. At approximately 02:00, Israeli forced moved into Marakah village, southwest of Jenin. They raided and searched several houses after which they arrested 3 brothers namely Mustafa (21), Majd (24) and Baha’a Hesham Abdul ‘Aziz (30). Around the same time, Israeli forces moved into Yatta, south of Hebron and stationed in Roq’ah neighborhood. They raided and searched a house belonging to the house of Khalil Yusuf ‘Ali Jabrin (17), who carried out the stab attack in front of “Rami Levy” shop in “Gush Etzion” settlement on 16 September 2018. Khalil was arrested after the soldiers opened fire at him and wounded him. The soldiers also detained many residents, who gathered in front of the house. Meanwhile, Khalil’s father, mother and brothers came back to the house. They were then arrested by the soldiers, taken to “Gush Etzion” military camp, south of Bethlehem, for investigation and detained for 13 hours. After the soldiers kept the residents away from the house and locked them in the outside yard, they raided and thoroughly searched the 3-storey house. The soldiers took the measurements of the house and photos from inside and outside. They then made holes in all the house walls using an electric excavator. After 3 hours, the Israeli forces left the house, but no arrests were reported. At approximately 03:00, Israeli force moved into al-Selah al-Harithiyah village, west of Jenin. They raided and searched a house belonging to Mothana ‘Aref Jaradat, an Arabic teacher at al-Yamoun Primary School adjacent to his village. An Israeli officer forced Mothana to hand over all the money he had and his wife’s jewelry and put them on the table. The soldier confiscated NIS 1,500, which were donations for the school, a gold catenary and 2 rings belonging to his wife and took photos of them. The soldiers then handed Mothana a list of the confiscated items and jewelry. They later withdrew from the house, and no arrests were reported. At approximately 03:30, Israeli forces moved into Beit Liqya village, west of Ramallah. They raided and searched a house belonging to Mahfouth Zuhdi ‘Asi (29) and then arrested him. Around the same time, Israeli forces moved into ‘Aboud village, northwest of Ramallah. They raided and searched a house belonging to Sadeq Abdul Ra’ouf al-Barghuthi (26) and then arrested him. At approximately 22:30, Israeli soldiers stationed along the border fence with Israel in eastern Khan Younis in the southern Gaza Strip opened fire at the area near the border fence in eastern al-Qararah, northeast of the city. After around 20 minutes, an Israeli drone launched 2 missiles at the same area. Later, the Spokesperson of the Israeli forces, Avichay Adraee, declared on twitter that a military drone “attacked saboteurs who suspiciously approached the security fence in the southern Gaza Strip and planted a suspicious object near it”. However, this was refuted by the PCHR’s investigations. 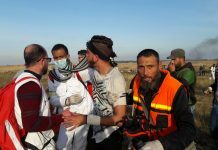 At approximately 00:15 on Tuesday, an ambulance crew belonging to the Palestine Red Crescent Society (PRCS) arrived in the vicinity of the area, and the ambulances stopped at the end of Street 2 to the east. After coordinating with the International Committee of Red Cross (ICRC), the ambulances started entering the border area and searching for possibly wounded persons. Meanwhile, the Palestinian Liaison via phone directed the ambulance crew to where the two persons killed exactly was after the former’s contacted with the Israeli Liaison. The PRCS crew said to PCHR’s fieldworker that at approximately 00:50 that near the barbed-wire fence established in the Palestinian territories, east of al-Qararah, that is around 50 meters away from the main border fence, they found two bodies of civilians dressed in civilian clothes. One of them turned into pieces while the second was wounded with shrapnel throughout his body and features of his face was unclear due to the targeting. The ambulance crew carried the two killed, taking them 300 meters away where the ambulances were parked. They were then taken to Naser Hospital in Khan Younis. Moreover, neither firearms nor suspicious objects were found near the bodies unlike what have been said by the Israeli Forces’ Spokesperson. On Tuesday Afternoon, 18 September 2018, families of the 2 persons killed identified them after their photos were published on social media. They were namely as Naji Jamil Hasan Abu ‘Aasi (17) and ‘Alaa Ziad Jamil Abu ‘Aasi (20); who are both from Bani Suhaila. Though the circumstances have not clarified the reason behind their presence in the scene, they posed no threat to the life of Israeli soldiers as they were both civilians and unarmed, noting that the area was calm and did not witness any protests. Moreover, many infiltrations into Israel for work there were reported in that area. At approximately 23:30, Israeli forces moved into Osarin village, southeast of Nablus amidst heavy firing of tear gas canisters. A number of children and youngsters gathered and threw stones and empty bottles at Israeli soldiers. The soldiers heavily fired rubber-coated metal bullets and tear gas canisters to disperse them. As a result, Warrad Fayham ‘Adili (50) was hit with a rubber bullet to the left eye. He was taken to Rafidiya Hospital in Nablus and then transferred to AnNajah National University in the city because the bullet settled in his eye. Doctors classified Warrad’s injury as serious and he was then transferred to Aqraba Charitable Clinic in the nearby ‘Aqraba village. During the clashes, Samer Hamdi ‘Adili (22) was arrested and then taken to an unknown destination. Following that, the Israeli forces closed the entrance to Osarin and ‘Aqraba villages, branching from ‘Aber al-Samera Street (505), with rocks and sand berms. Note: During the aforementioned day, Israeli forces conducted (5) incursions in the following areas and no arrests were reported: Hebron, al-Shuyoukh, and Deir Samet village in Hebron; ‘Azzoun village, east of Qalqiliyah; Hablah village, south of the city. At approximately 01:00, Israeli forces moved into Dura, south of Hebron and stationed in Sangar neighborhood. They raided and searched a house belonging to Ibrahim Ma’moun Nassar (24) and then arrested him. At approximately 02:00, Israeli forces moved into Surif village, northwest of Hebron and stationed in the western neighborhood. They raided and searched several houses after which they arrested Husam Ahmed al-Hour (27), Ahmed Mahmoud al-Qadi (30) and Fadi ‘Ayed Ghuneimat (28). At approximately 02:30, Israeli forces moved into ‘Arabah village, southwest of Jenin. They raided and searched a house belonging to Mohammed Abdul Latif al-Shebani (43) and then arrested him. At approximately 04:00, Israeli forces moved into ‘Azoun village, east of Qalqiliyah. They raided and searched a number of houses and then arrested Wahbi Mousa Ahmed al-Khuli (27), Ayoub Farouq Abu Haniyah (33) and ‘Amid Ayoub Fawzi Zamari (23). Note: During the aforementioned day, Israeli forces conducted (3) incursions in the following areas and no arrests were reported: Hebron and Sa’ir village, northeast of the city, Howarah village, and south of Nablus. At approximately 18:00, an Israeli infantry unit moved into Qaitoun neighborhood in Hebron’s Old City, adjacent to the Ibrahimi Mosque, as the Old City has witnessed a heavy deployment of Israeli soldiers due to the Jewish holidays. They then raided and searched a house belonging to Shaher Ibrahim Abu Sbaih. Meanwhile, a verbal altercation and hand-fight between the soldiers and the house inhabitants occurred, the soldiers then knocked Shaher to the ground. The Israeli forces later withdrew from the house, and no arrests were reported. Note: During the aforementioned day, Israeli forces conducted (3) incursions in the following areas and no arrests were reported: Hebron, Sa’ir, Shuyoukh al-‘Aroub villages and Yatta in Hebron; Beta village, southeast of Nablus. On Wednesday, 12 September 2018, the Israeli authorities allowed 2 persons; and on Thursday, 13 September 2018, 8 persons to return to the West Bank. On Thursday, 13 September 2018, the Israeli authorities allowed a doctor; and on Friday, 14 September 2018, another doctor to travel via the crossing to attend a medical course. On Tuesday, 18 September 2018, the crossing was closed, except for humanitarian cases, under the pretext of Jewish holidays. Ramallah and al-Beirh: Israeli forces established (5) all over the City. On Thursday, 13 September 2018, Israeli forces established 2 checkpoints at the entrance to Beit Rima village, northwest of Ramallah, and at the entrance to ‘Ain Ybroud village, northeast of the city. On Friday, 14 September 2018, 3 similar checkpoints were established at the entrances to ‘Aboud and al-Nabi Saleh villages, northwest of Rmallah; and at the entrance to ‘Our Tahta village, west of the city. On Thursday, 13 September 2018, Israeli forces established 3 checkpoints at the entrances to Samou’a, al-Dahiriyia and Beit al-Roush villages. On Friday, 14 September 2018, 4 similar checkpoints were established at the southern and northern entrances to Hebron, and at the entrances to Beit Ummer and Karmah villages. On Saturday, 15 September 2018, Israeli forces established 3 checkpoints at the southern entrance to Hebron, and at the entrances to Sureef and Ethan villages. On Sunday, 15 September 2016, 6 similar checkpoints were established at the southern entrance to Hebron, at the northern and western entrance to Yatta village, on Khelet al-Mayah and al-Berkah Roads, west and east of Yatta, and at the entrances al-Fahs and Bani Na’iem villages. On Monday, 17 September 2018, Israeli forces established 3 checkpoints at the northern entrance to Yatta, at the entrance to Sa’ir village, and at the entrance to al-Fawar refugee camp. On Tuesday, 18 September 2018, 2 similar checkpoints were established at the entrance to al-‘Aroub refugee camp and at the entrance to Beit Ummer village. On Wednesday, 19 September 2018, Israeli forces established 4 checkpoints on Khelet al-‘Ain Road, east of Beit Ummer; on Hasaka Road, south of Halhoul; on Wad Risha Road, west of Ethna and its western entrance. On Thursday, 13 September 2018, Israeli forces established 2 checkpoints at the entrances to Jeinasafout and ‘Izbit al-Tabeeb villages, east of Qalqiliyia. On Saturday, 15 September 2018, 2 similar checkpoints were established at the entrances to ‘Azoun and ‘Izbit al-Tabeeb villages. At approximately 13:50 on Saturday, 15 September 2018, Israeli forces established a checkpoint at the eastern entrance to Qalqiliyia. On Sunday, 16 September 2018, 2 similar checkpoints were established at the entrances to Amateen and ‘Izbit al-Tabeeb villages, east of the city. At approximately 21:50 on Monday, 17 September 2018, Israeli forces established a checkpoint at the entrance to Jeet village, northeast of Qalqiliyia. On Friday, 14 September 2018, Israeli forces established 2 checkpoints at the entrances to Dir Balout and Burqeen villages, west of Salfit. On Monday, 17 September 2018, 2 similar checkpoints were established at the northern entrance to Salfit and at the entrance to Kaful Hares village, north of the city. At approximately 18:30 on Thursday, 13 September 2018, Israeli forces established a checkpoint at the intersection of Jabarah village, south of Tulkarm. At approximately 20:00 on Saturday, 15 September 2018, a similar checkpoint was established at the intersection of Bazaryia village, east of ‘Enbitah, east of the city. At approximately 20:50 on Monday, 17 September 2018, Israeli forces established a checkpoint at the intersection of Beit Lid village, east of the city. At approximately 20:30 on Sunday, 16 September 2018, Israeli forces established a checkpoint near a prior an Israeli campestablished between Jabi’ and Nasour villages, southeast of Jenin. At approximately 07:00 on Tuesday, 18 September 2018, Israeli forces stationed at Hawarah checkpoint, at the southern entrance to Nablus, tightened their arbitrary measures against Palestinian civilians and obstructed the vehicles movement. At approximately 07:30 on Thursday, 13 September 2018, Israeli forces arrested Qusai Shehada Ghaith (13) and ‘Odai Sufyan Abu Hittah (9) while heading to their school near the military checkpoint (106) in Hebron’s southern area. Both of them were released 2 hours later. It should be noted that abovementioned area has witnessed Israeli attacks several times. At approximately 10:00, Israeli forces arrested Ahmed ‘Atif al-‘Awawdah (14), from Dir Samet village, southwest of Hebron, while he was in the vicinity of al-Ibrahimi Mosque in the Old City. The Israeli forces claimed that they found a knife with Ahmed and he was then taken to an investigation center in “ Kriyat ‘Arba’” settlement, east of Hebron. At approximately 20:10, Israeli forces stationed at a military checkpoint established at the eastern entrance to Qalqiliyia, arrested Sa’ied Belal Sa’ied Swilem (25) while getting out of the city and passing through the checkpoint. At approximately 20:30 on Thursday, Israeli forces stationed at Hawarah checkpoint, at the southern entrance to Nablus, arrested two brothers namely Kamal (45) and Murad Saleh Shariy’ah (18), from al-Quds Street, east of the city. At approximately 09:00 on Tuesday, 18 September 2018, Israeli forces stationed at al-Container checkpoint, northeast of Bethlehem, arrested Rania Wajeeh Mahmoud Doweek (19), while passing though the checkpoint. At approximately 18:30 on Wednesday, 19 September 2018, Israeli forces arrested ‘Abdullah Mohamed Abu ‘Aisha (33), from Tal Ramidah neighborhood in Hebron, after assaulting him by a group of Israeli settlers deployed in the neighborhood under the pretext of Jewish holidays. On Tuesday afternoon, 18 September 2018, Israeli police officers opened fire at Mohammed Yousif ‘Alian (26) from Qalednia refugee camp, north of occupied East Jerusalem, wounding him with 15 bullets that hit different parts of his body, and immediately killed him. The Israeli police claimed that the aforementioned attempted to stab an Israeli settler while walking in al-Mosrarah area near the Damascus Gate in the centre of the occupied City. According to PCHR’s initial investigations, at approximately 19:20 on the abovementioned day afternoon, when ‘Alian was near the Damascus Gate area, he pushed one of the Israeli settlers and fled away. The settler asked for the Israeli police’s help, so the police officers shouted at ‘Alian, ordering him to stop; however, the latter kept running. One of the Israeli police officers then chased him to al-Mosrarah area and heavily opened fire at him, killing him immediately. The Israeli police left ‘Alian bleeding on the ground for 3 hours and denied the PRCS staff from approaching him. After taking his fingerprints and doing various inspections, the Israeli forces took the body to an unknown destination. Moreover, due to the random shooting at the deceased, the bullets hit a vehicle parked there and a shop window. The Israeli Police claimed that ‘Alian attempted to stab an Israeli settler with a sharp tool “a small screwdriver.” They added in their statement that “while on duty on Yom Kippur, the holiest day on the Jewish calendar, the police officers noticed a suspect running at a Jewish person, attempting to harm him, and knocked him to the ground. They said the suspect then ran, brandishing a sharp object, while the police officers neutralized him.” Following this, the Israeli police closed all Jerusalem’s Old City Gates and denied entry and exit. Large force of Israeli soldiers moved into al-Mosrarah Street and sealed off the street where the body was lying, forcing civilians to move away from the area. They also forced the surrounding shops’ owners to close and confiscated the surveillance cameras. At approximately 03:00 on Thursday, 13 September 2018, Israeli forces moved into Hizmah village, northeast of occupied East Jerusalem. They raided dozens of houses belonging to the families of prisoners in the Israeli jails and other former prisoners. The Israeli forces withdrew the permits that allow them to enter Israel and occupied Jerusalem, in addition to withdrawing a building owner’s license under the pretext of continuing throwing stones in the village. 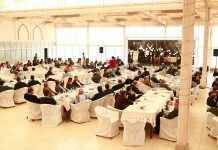 The mayor of the Hizmah village, Samar Salah al-Deen, said that the Israeli forces moved into the village, raided dozens of houses belonging to the families of prisoners in the Israeli jails and other former prisoners, and then withdrew their entry permits to Israel and occupied Jerusalem for a month and a half. They also withdrew a building owner’s construction license under the pretext that he could tell about the stone-throwers and did not do so. She also pointed out that all persons, whose permits were withdrawn, will give them back after calmness returns to the village and stone-throwing, which harm dozens of jews, their vejciles and buses, stops. At approximately 03:00 on Saturday, 15 September 2018, Israeli forces moved into Sho’fat camp, north of occupied East Jerusalem. They raided and searched houses from which they arrested Adham Mahmoud al-Hendi (32), ‘Amr Khashan (29), Ayman ‘Abdullah Abu Mayyalah (31), and Mahmoud al-Faqqeih (27). At approximately 04:00 on Sunday, 16 September 2018, Israeli forces moved into al-Salam suburb in ‘Anata village, northeast of occupied East Jerusalem. They raided and searched a house belonging to Mohamed ‘Azzam al-Natshah (25) and then arrested him. At approximately 18:00 on Sunday, Israeli forces moved into Qalandia refugee camp and Kafur ‘Aqub village, north of occupied East Jerusalem, after an Israeli bus carrying Palestinian prisoners entered Ramallah-Jerusalem Street, adjacent to Qalandia military checkpoint. Palestinian young men threw stones, empty bottles and Molotov Cocktails bottles at the bus. The Israeli forces heavily fired live bullets and tear gas canisters at them. As a result, dozens of civilians suffered tear gas inhalation while 2 other civilians sustained tear gas canister shrapnel wounds and were then taken to nearby medical centers to receive medical treatment. Few hours later, the Israeli forces moved into the abovementioned camp again. They raided and searched houses, from which they arrested Ibrahim Sami Mutair (32), Mahmoud ‘Isaa al-Mallah (31) and Khaled Mohamed ‘Antar (29). At approximately 02:00 on Monday, 17 September 2018, Israeli forces moved into al-‘Issawiyia village, northeast of occupied Jerusalem. They raided and searched houses, from which they arrested 9 civilians, including 3 children. The arrested civilians were then taken to a dentation facility in Jerusalem for investigation. PCHR keeps the names of the arrested civilians. At approximately 03:00 on Tuesday, 18 September 2018, Israeli forces moved into Qalandia refugee camp, north of occupied East Jerusalem. They raided and searched houses, from which they arrested Kareem Mohamed Abu Latifa (34) and Shadi Y’qoub (31). The Israeli forces also confiscated NIS 15.000 from a house belonging to Mohamed Mahmoud Mutair. At approximately 10:00 on Tuesday, hundreds of Israeli settlers under the Israeli forces’ protection raided al-Aqsa Mosque in occupied East Jerusalem’s Old City, to celebrate Yom Kippur, one of the holiest Days on the Jewish calendar. The Israeli forces violently attacked the Palestinian worshipers and Islamic Endowments (Awqaf) department’s staff. Feras al-Debis, Media and Public Relation Officer at the Islamic Endowments Department, said that the Israeli forces attacked Palestinian worshipers and Islamic Endowments Department’s staff and indiscriminately and severely beat them. The Israeli forces then turned the al-Aqsa Mosque into a military barrack, where the Israeli police officers and Special Forces heavily deployed. Feras al-Debis added that the Israeli forces provide full protection for a large number of Israeli settlers, who raided the mosque. In total, about 326 Israeli settlers raided the al-Aqsa Mosque since the early morning and afternoon. During which, the Israeli police officers deployed at the mosque’s gates, detained the IDs of those entering the mosque and prevented those who refuse to give their ID cards from entering. Dr. Mohamed Jaddallah, who works at al-Aqsa Mosque’s Clinics, said that 7 persons sustained bruises to the shoulder, chest and back. All of those wounded were then referred to al-Maqased Hospital to receive medical treatment. Moreover, the Israeli forces arrested 12 civilians from the al-Aqsa Mosque yards. PCHR keeps the names of the arrested civilians. From the southern and northern sides: University Street- Wadi al-Jouz- via Jericho- al-Awafel Street towards Temple Mount. From eastern side: from al-Tour to Shamou’iel Bin ‘Adiyia Road- via Jericho- via al-Awafel Street towards Al Buraq (Wailing Wall). From southern side: from Beit Safafa to al-Mazmoryiah- Surbaher- al-Mukaber Mount- Silwan- Ofeel Road- Temple Mount. Moreover, Road (1) will be closed at the intersection of Arzim towards “Sakharov “.